Two weeks ago I called Abzan Company one of the top decks of the format. Last weekend, in Indianapolis, Abzan Company failed to even crack the Top 32. Instead, the top tables were overrun with copies of Infect and R/G (Tron and Valakut), while Jeskai Control took home the trophy. Today, we’ll analyze the results of the Star City Games Indianapolis Open, looking at archetype performance and digging deeper into specific lists for technology and information. Let’s get to it! At a macro level, we can infer a few things about the state of Modern from this information. First, linear aggro is successfully being pushed out of the metagame. Affinity only managed to sneak one copy into the Top 32, and decks like Zoo and Merfolk are nowhere to be found. In their place, the pendulum has shifted to focus on various fast, non-interactive combo decks as the new Level 0. Level 1 decks (archetypes that boast positive matchups against the expected Level 0) include control decks, or midrange/tempo decks with access to disruption and permission elements respectively. Thus, we see fast combo decks like Infect and Tron gearing their sideboards to fight both Abzan Company and the (now defunct) old Level 0 of aggro decks like Zoo and Affinity. R/G Tron specifically is able to capitalize on a natural advantage against Abzan Company while tooling their maindecks and sideboards to fight linear aggro. In response to this positional shift, control decks are finding success against this new influx of linear combo. Jeskai Control at an archetype level is an excellent choice against a combo/creature-heavy field, and less so against a field full of other control decks and grindy midrange archetypes like Jund and Abzan. While those decks exist and are putting up small numbers, an overwhelming majority of the format are either combo- or creature-based archetypes that Jeskai excels at defeating. Before moving on, let’s dive a little deeper into some specific lists to see what information we can glean from the results. As always, we start with the champion list, this time Jeskai Control in the hands of Peter Ingram. The biggest piece of technology here is the full embrace of a playset of Nahiri, the Harbinger and a singleton Emrakul, the Aeons Torn. Where Jeskai Control decks of old were forced to take total control through over-the-top measures like Sphinx’s Revelation or Gideon Jura, here Nahiri, the Harbinger has given the archetype a much cleaner path to victory. 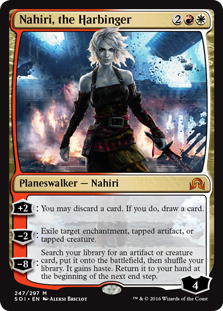 I will admit, I was initially pretty cool on Nahiri in Modern, but she has proved herself a capable inclusion in multiple archetypes and is directly responsible for the current success WR Control enjoys in the format. The rest of Ingram’s list is fairly standard, though we are starting to see a scale-back in Ancestral Vision, with no copies in the maindeck and only two in the sideboard. The format has proven itself to be quite capable of handling Ancestral Vision’s inclusion, with Remand, discard, and Chalice of the Void on 0 proving effective enough to keep it in check. The card is still very strong, just not broken. Expect Ancestral Vision’s use to fluctuate based on metagame factors, but also specific archetype construction. Ingram has shown that you can build a blue-based control deck without Ancestral Vision. The same (currently) cannot be said for Snapcaster Mage or Serum Visions. Daniel’s RG Valakut deck seems fairly standard for this archetype, which has been around for a couple months now to the point that we can no longer call it “new.” Rather than stretching to three colors to play Scapeshift with permission or colorless lands, the red-green version seeks to consistently and promptly deliver Primeval Titans to the battlefield. The biggest piece of tech here is the use of Oath of Nissa as a green Ponder of sorts (not suggesting it is as strong as Ponder, so lower the pitchforks) to supplement the four Search for Tomorrows as turn-one plays. Search for Tomorrow allows for turn-three Through the Breach, and while Oath of Nissa doesn’t ramp us, it does allow us to find extra copies of Primeval Titan and Sakura-Tribe Elder. I’ve had a fair amount of experience against this archetype playing both Grixis Control and Naya Blitz. The deck is consistent and fast, and even a hyper-aggressive deck like Naya Blitz has trouble killing fast enough in Game 1s. Postboard, Valakut has access to Obstinate Baloths and Anger of the Gods to make this matchup quite poor for aggressive decks, to the point where I believe it can devote more energy to focus on its relatively poor control matchup. I’ve seen variations with Khalni Heart Expedition for explosive mana development, Kozilek’s Return for maindeck board control, and Scapeshift/Summoning Trap for extra threats. Could this be the beginning of a Grixis Delver revitalization? Ryan Overturf brought to Indy, in my opinion, the best deck for the field. Correctly anticipating a field full of control, combo, and Infect, Ryan capitalized on the lack of Abzan Company, Affinity and Burn with his choice of Grixis Delver. Delver of Secrets (along with four delve creatures) puts a quick clock on opponents, and when backed up with permission can be absolutely deadly against an unprepared opponent. Speaking of unprepared opponents, talk about a field ripe for the picking. RG Valakut decks with four Lightning Bolt as interaction? No Scapeshift or blue to defend their bombs? Overturf got mileage out of his playset of Mana Leak over the course of the weekend for sure. Infect is a relatively simple matchup as well, as Grixis Delver’s inherent self-damage is free against the archetype. With enough removal and permission to go toe-to-toe with Infect’s tricks, the matchup is solid for an experienced opponent. Jeskai Control, on the other hand, can be a difficult matchup, as their 4x Path to Exile and Lightning Bolt make it difficult to present a strong attack. Still, should Abzan Company, Burn and Affinity remain pushed out of the metagame, Grixis Delver will continue to put up strong results. A few weeks ago, Remand was excellent against half the metagame (Ancestral Vision, combo archetypes) and atrocious against the rest (linear aggressive decks). Currently, combo has risen and aggressive decks have fallen in popularity, to the point where Remand is possibly at the same relative position it was before, despite all these changes. Hard counters are definitely better. I’m back to playing a Deprive in my Grixis Control maindeck. Mana Leak is a solid enough answer to Living End, Primeval Titan and the like, but the card Scapeshift is seeing increased play in dedicated Scapeshift archetypes and RG flavors as well. Kalitas, Traitor of Ghet is slipping, and Tasigur, the Golden Fang‘s stock is rising. Maindeck lifelink is an excellent thing, and Kalitas does strong incidental work against Kitchen Finks, Voice of Resurgence—the whole Abzan Company deck, really. But Tasigur, the Golden Fang‘s ability to come down fast and hit hard, with minimal mana investment that allows for counterspell interaction, cannot be understated in a combo-focused metagame. Where is Thopter-Sword? Affinity has fallen off the map, and it’s just a matter of time before players start trimming their sideboard Ancient Grudge and Stony Silence in favor of silver bullets for other matchups. So far, the most impressive Thopter-Sword deck I’ve seen has been UW Gifts, and that archetype has a million options available to it that I know will make tuning a worthwhile endeavor. This week, we saw the field adjust to the strength of Abzan Company, shifting solidly to a new form defined by fast combo and reactive decks. Where the Eldrazi metagame of old favored aggressive, linear strategies, this new Modern has proven to be quite hostile to traditional combat-focused strategies. In their place, combo decks like Tron, Affinity, and to a lesser extent Ad Nauseum and Living End, have risen to replace them. Tron is experiencing a strong resurgence, and its re-entry into the format will bring with it some interesting consequences. Abzan Company will clearly diminish in popularity, and midrange/control strategies like Jund and Jeskai will be forced to make some adaptions to deal with this matchup, weakening their positions elsewhere. Where the format moves from here is too early to tell, but it will be interesting to see whether the combo decks or the control decks come out on top of this developing tug-of-war. Thanks for reading, and I’ll see you next week! On Remand, if the part that it is good against has risen, and what it is bad against has sunken, how does that result in a net neutral? Perhaps there is a good reason for this, but otherwise, the statement seems rather silly. I would imagine its because remand was badly situated before. So by a decline in linear aggressive deck it went from being bad to neutral so to speak. Good article, but I don’t understand why you say Grixis Delver benefits of the lack of affinity. I have played plenty of grixis delver and I believe affinity is one of our best pairings, up there with infect. And with overturf’s lists the percentatges only can go up since he is packing 4 snare which are the best card against affinity. We usually pack a lot of cheap removal and we even have flyers to block. I’m also confused by that statement as well. Grixis Delver is my favorite deck in modern and I’m always disappointed that no one in my store plays Affinity anymore. I have to say, Overturf’s Grixis Delver list looks downright spicy. 20 lands and Ancestral Vision in the board give it more of a midrange feel than what I’m used to, but that might be a good thing when it comes to taking down Delver’s eternal nemesis (BGx Midrange). I think it’s a good place to start from when figuring out how the archetype fits into the current meta. I see you put in the Grixis Delver deck as tempo/aggro, but in fact is more of a tempo/midrange or tempo/control, specially when sideboarding, when it becomes one of the grindiest decks of the meta, that even wins the midrange king (jund). just saw Ryan playing it on SCG and he was not even slamming Delver T1 even if he had 2 copies of it. Just waited until he grinded, and then slam the beasts.